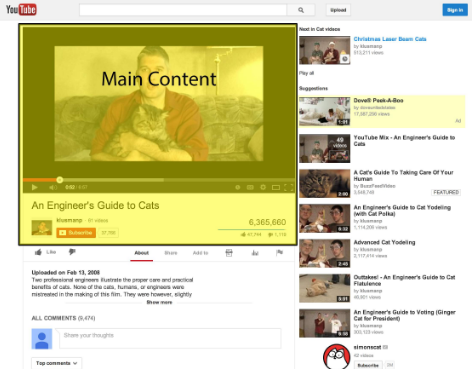 8.6 Obstructed or Inaccessible Main Content. 1. Understand the true purpose of the page. Websites or pages without any beneficial purpose, including pages that are created with no attempt to help users, or pages that potentially spread hate, cause harm, or misinform or deceive users, should receive the Lowest rating. No further assessment is necessary. ● Website Information/information about who is responsible for the MC: Find information about the website as well as the creator of the MC. ●Website Reputation/reputation about who is responsible for the MC: Links to help with reputation research will be provided. ● High E-A-T medical advice should be written or produced by people or organizations with appropriate medical expertise or accreditation. High E-A-T medical advice or information should be written or produced in a professional style and should be edited, reviewed, and updated on a regular basis. ● High level of Expertise, Authoritativeness, and Trustworthiness (E-A-T). ● Very high level of Expertise, Authoritativeness, and Trustworthiness (E-A-T). ● The author of the page or website does not have enough expertise for the topic of the page and/or the website is not trustworthy or authoritative for the topic. In other words, the page/website is lacking EAT. ● The creator of the MC does not have adequate expertise in the topic of the MC, e.g. a tax form instruction video made by someone with no clear expertise in tax preparation. expertise, and talent/skill have gone into the creation of the page, and also informs the EAT of the page. ● Buying papers online or getting someone else to write for them. 1. Understand the true purpose of the page. Websites and pages should be created for users in order to serve a beneficial purpose, in other words, they should exist to help users. 2. Websites or pages without a beneficial purpose, including pages that are created with no attempt to help users, or pages that potentially spread hate, cause harm, or misinform or deceive users, should receive the Lowest rating. E-A-T and other page quality characteristics do not play a role for these pages. For example, any page attempting to scam users should receive the Lowest rating, whether the scam is created by an expert or not. 3. 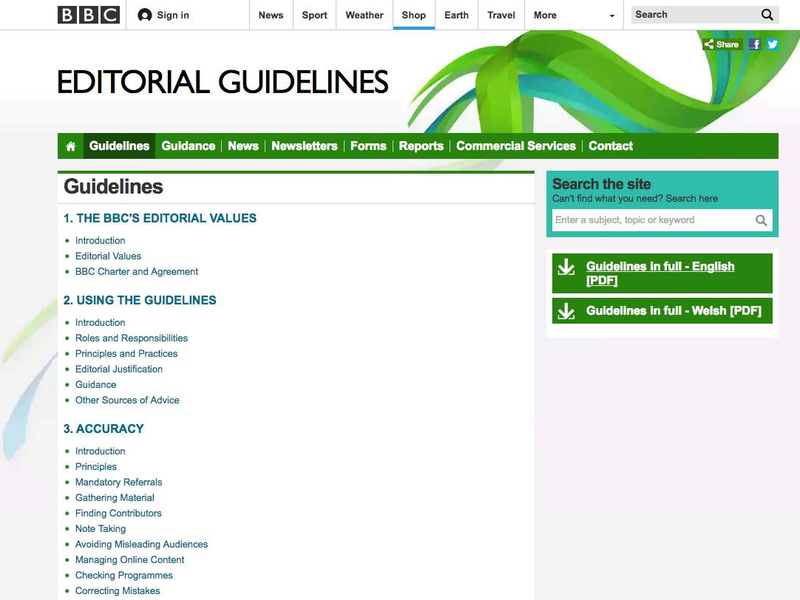 Otherwise, the PQ rating is based on how well the page achieves its purpose using the criteria outlined in these guidelines. 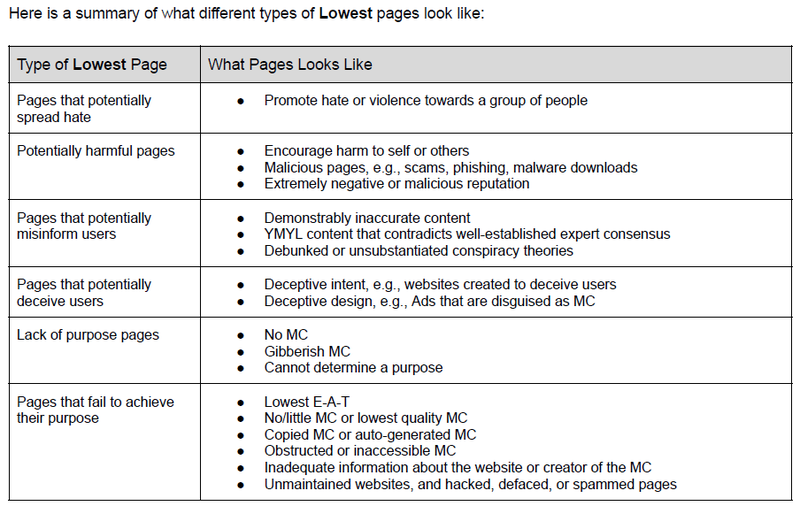 Pages that fail to achieve their purpose should receive the Lowest rating. ● Informational pages with demonstrably inaccurate MC. ● Ads that continue to cover the MC as you scroll down the page, that are virtually impossible to close without clicking on the Ad. ● An interstitial page that redirects the user away from the MC without offering any path back to the MC. content. These pages should also be rated Lowest because they fail to accomplish their original purpose. ● User discussions that attempt to justify sexual abuse of children. ● How-to or step-by-step information on how to commit acts of terrorism or violent extremism. ● Depictions of extreme gore or violence, without a beneficial purpose. ● Suicide promotion or pro-anorexia webpages that encourage users to engage in behavior that can result in hospitalization or death. ● Pages with scary death threats or other realistic-sounding threatening language. ● YMYL content that contradicts well-established expert consensus. ● Debunked or unsubstantiated conspiracy theories. 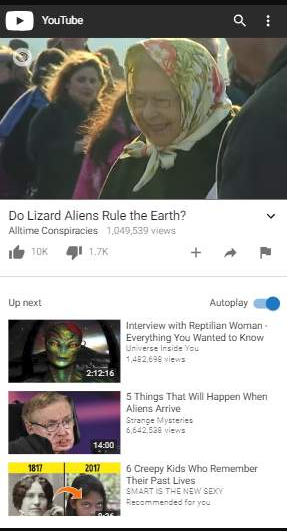 ● The content creator may believe that the conspiracy theory or demonstrably inaccurate content is correct, or it is unclear whether they do. ● The content creators may be deliberately attempting to misinform users. ● The content creators describe, repeat or spread conspiracy theories or demonstrably inaccurate content without a clear effort to debunk or correct it, regardless of whether the creators believe it to be true. 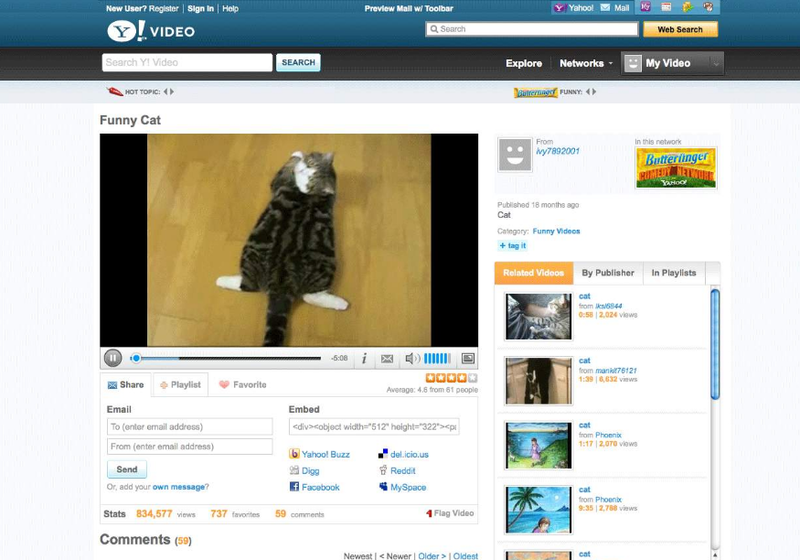 For example, content creators may produce this content in order to make money or gain attention. ● A webpage or website that impersonates a different site (e.g., copied logo or branding of an unaffiliated site, URL that mimics another site’s name, etc.). ● A non-satirical social network profile made by an impersonator. 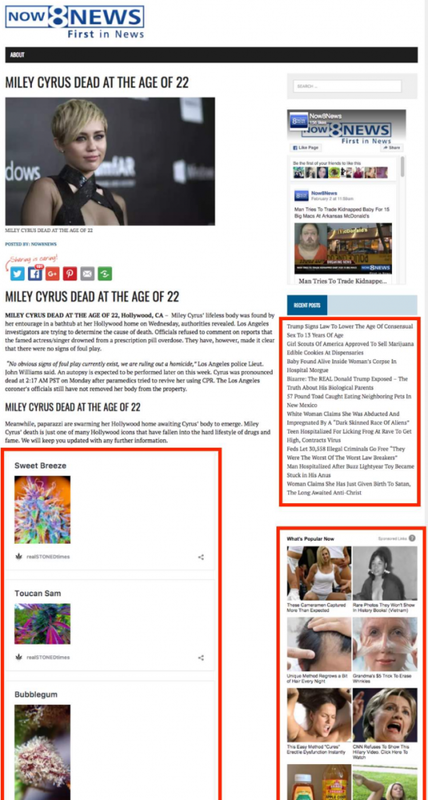 ● A webpage or website that looks like a news source or information page, but in fact has articles to manipulate users in order to benefit a person, business, government, or other organization politically, monetarily, or otherwise. ● A webpage claims to offer an independent review or share other information about a product, but is in fact created to make money for the owner of the website without attempting to help users. For example, the MC may contain intentionally misleading or inaccurate information created with the sole purpose of getting users to click on monetized links or buy the product. ● A website claims to be the personal website of a celebrity, but the website is actually created to make money for the owner of the website without the permission of the celebrity. For example, the page may have false testimonials for a product and is created for the sole purpose of getting users to click on monetized links or buy the product. ● A webpage with a misleading title or a title that has nothing to do with the content on the page. Users who come to the page expecting content related to the title will feel tricked or deceived. ● A webpage or website with deceptive website information. For example, the website may misrepresent who owns the site, what the website purpose really is, how the content was created, how to contact the site, etc. of the creator of the content on the page. ● All content on the website is produced by the same person or organization. An example is a medical website that is produced by a reputable physician group. ● The content of the website is produced by different authors or organizations, but the website has very active editorial standards. 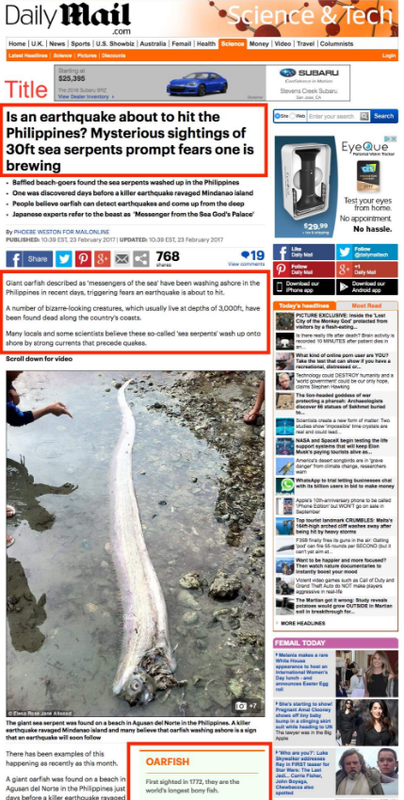 An example of this is a science journal with very high standards for publication. ● The website has an extremely positive reputation from experts in the topic of the website, i.e., the website is acknowledged to be one of the most expert, authoritative, or trustworthy sources on the topic. the purpose of the page, the Low or Lowest rating is appropriate. be uncomfortable for some users. ● Content that promotes hate or violence against a group of people based on criteria including (but not limited to) race or ethnicity, religion, gender, nationality or citizenship, disability, age, sexual orientation, or veteran status. ● Content with racial slurs or extremely offensive terminology without context or beneficial purpose. ● Depiction of graphic violence without context or beneficial purpose. ● Graphic violence, including animal cruelty or child abuse. Upsetting-Offensive” to “For example, a result with content that encourages child abuse should be flagged as Upsetting-Offensive.” Perhaps they felt some results were not being flagged because they didn’t graphically depict child abuse, but depicted it in another way. life. Give high Needs Met ratings to results that allow users to research, browse, and decide what to purchase. pricing), viewing and considering various options (browsing), etc. (e.g., cars, washing machines, computers, wedding gifts, baby products, hurricane shutters, large fitness equipment). When buying products, users need websites they can trust: good reputation, extensive customer service support, etc. Results for product queries may be important for both your money and your life (YMYL)! Nice synopsis, Jenn! That took some time – much appreciated. This is like longest article, Its more than 12500+ words. super efforts I must say. Your work speaks volumes of the kind of person you are – efficient, organized and result-oriented. The .pdf was removed by Google. Do you have a copy of it? Can you upload it on your site? Thanks for this excellent in-depth breakdown, Jennifer! 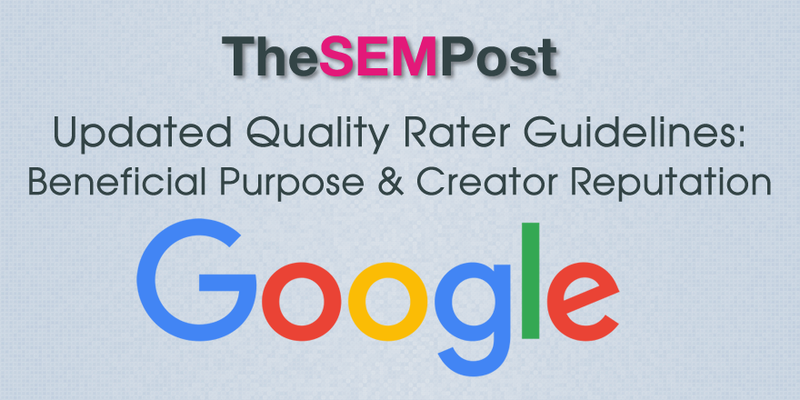 As a writer and marketer, I’m intrigued by the Quality Rater Guidelines, and I’m glad to see Google puts such an effort into making sure searchers are finding quality information online. Very insightful and useful post, Jennifer. Google has taken it down now 🙂 No explanation given. I was wondering how you determined that the document came directly from google and wasn’t create by a 3rd party? Is there any information from the horses mouth? I noticed that the section 7.2.5 isn’t consistent in the information they are providing. They are explaining how to find copied content and the example that you are suppose to find is wrong.